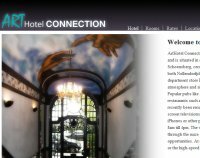 ArtHotel Connection, the Grande Dame of Berlin's gay hotels is 'hetero-friendly' and is situated in a quiet, tree-lined street in the charming district of Schoeneberg, centrally located in Berlin's 'City-West'. A stone's throw from both Nollendorfplatz and Wittenbergplatz - home of the world-renowned department store KaDeWe - this art-nouveau hotel is known for its friendly atmosphere and sits in the heart of the German capital's famous gay village. Popular pubs like Prinzknecht, Mutschmanns and Heile Welt and excellent restaurants such as Sissi and More are just a few steps away. The rooms have recently been renovated and equipped with hi-tech electronics such as wide flat-screen televisions, DVD-players, laptop safes and even docking stations for iPhones or other personal music devices. Breakfast is served upon request from 8am till 4pm. The well-informed staff is always ready to help you navigate through the maze of Berlin's night-life, cultural offerings and sightseeing opportunities. At no extra charge guests are welcome to use the internet terminal or the high-speed WiFi service en suite. This 4-star hotel in Berlin's gay area offers designer rooms, a rooftop bar with panoramic views, and a modern spa. The brand new Axel Hotel Berlin just opened its doors a few months ago. Centrally located in the Schöneberg District, it lies just minutes away from the Kulturforum, the Tiergarten and the world famous KaDeWe department store on the celebrated Kurfürstendamm Boulevard. Schöneberg is well-known for its numerous restaurants, bars and boisterous gay scene. The 'heterofriendly' Axel Hotel Berlin is famous for its open-minded atmosphere and avant-garde design. The attractive and friendly staff offer outstanding service and are knowledgeable of the local gay scene. Its unique design, exhumes glamour and elegance with a resolutely avant-garde vibe. The rooms are luxuriously appointed with sleek furniture and equipped with the latest technology. Quench your spirit at at the 'Urban Bar', a happening venue in the gay scene, and enjoy the creative cuisine of 'Kitchen' restaurant and its relaxing garden. The splendid roof terrace is the perfect place to relax and sun bath in summer. Indulge yourself in the Wellness area, featuring a Jacuzzi, two saunas, a fully-equipped fitness room and a massage room. Set in the heart of Berlin's gay-friendly Schöneberg district, this men-only guest house offers free Wi-Fi and bright rooms with a flat-screen TV. Bananas Berlin Gay Guesthouse is 750 metres from Nollendorfplatz square. Rooms at Bananas are individually decorated with stylish artwork, and a mixture of contemporary and classic furnishings. Modern shared bathroom facilities are available for guests’ use. Bananas Gay Guesthouse also features an appealing lounge area, complete with elegant tables and chairs. Guests are a 2-minute walk from the popular Motzstrasse, with bars, restaurants and cafés. The guest house has excellent transport links, just 200 metres from Viktoria-Luise-Platz and a 10-minute walk from Nollendorfplatz Underground Station. Alexanderplatz square can be reached in 20 minutes on the U2 underground line. KaDeWe Department Store is a 10-minute walk away. This gay hotel is located in Berlin's Schöneberg district, a 4-minute walk from Nollendorfplatz Underground Station. All comfortable rooms and apartments feature a flat-screen TV and free Wi-Fi internet access. Tom's Hotel Berlin offers artistically decorated rooms which include a DVD player and private bathroom with shower. Free fruit and mineral water is available in every room. Tom's Hotel is located in the heart Berlin's exciting gay district. Hotel guests receive a special pass, offering discounts to many nearby gay saunas, nightclubs, shops and restaurants. 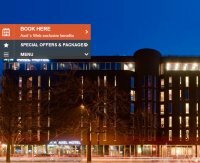 Tom's Hotel Berlin is a 10-minute walk from Wittenbergplatz Underground Station, the Ku'damm shopping boulevard and the world-famous KaDeWe department store. There are excellent bus and underground connections to all parts of Berlin.